What is a Keyword Group? 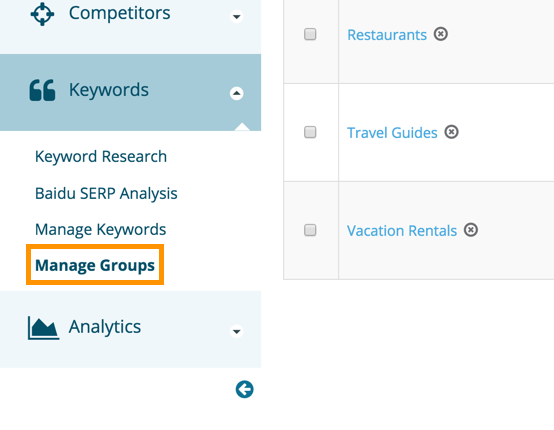 Keyword groups in Dragon Metrics are sets of tracking keywords, search engines / regions / languages / devices, and competitors. Each campaign can have one or more keyword groups. 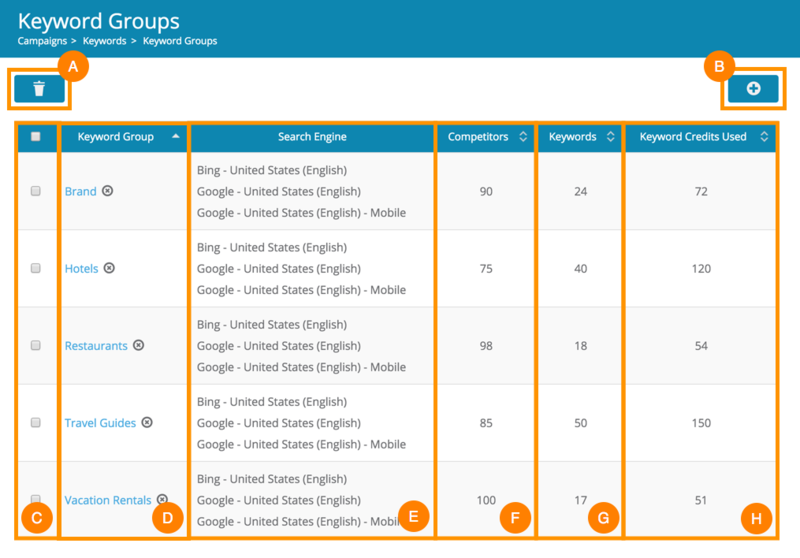 Keywords placed in keyword groups will begin tracking ranking data. If a keyword is not added to a keyword group (e.g. if it's only added to Keyword Management), it will not be tracked in search engines. Related FAQ: How do I start track ranking for my keywords? Why Use Multiple Keyword Groups? While each keyword group will still use the same website URL set up for the campaign, each keyword group can track a different set of search engines / regions / languages / devices / locations and competitors. If you expect that all keywords in the campaign will have the same set of competitors and search engines, using one keyword group will most likely be easiest. You can then choose to group and organize keywords using tags. 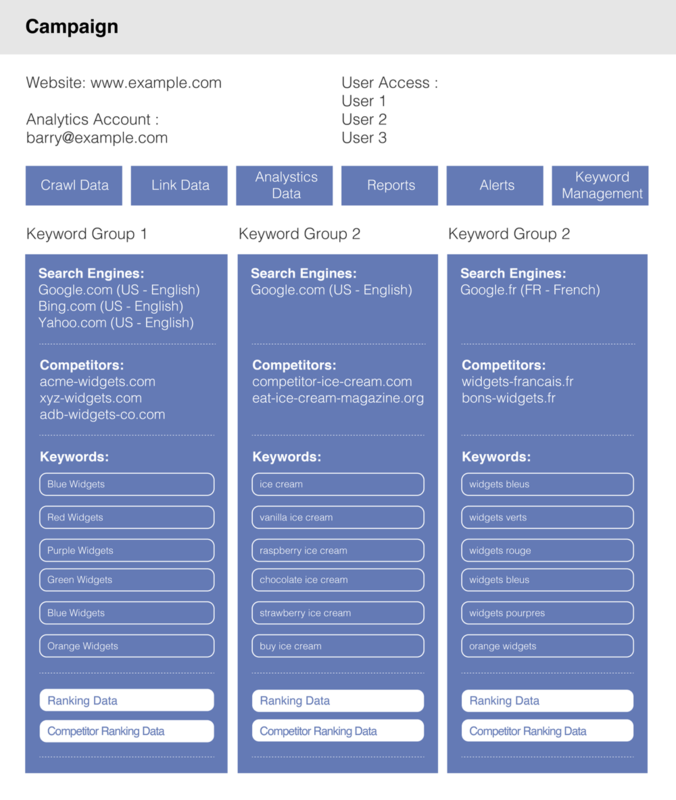 In other scenarios, it may be useful to create multiple keyword groups. Each keyword group can track a different set of search engines, each with their own region and language. However, it can be wasteful of keyword credits to track multiple language keywords in the same keyword group. Each keyword / search engine combination that is tracked counts as one keyword credit. This means that 100 keyword credits would allow you to track 20 keywords in 5 search engines, 50 keywords in 2 search engines, or some other similar configuration. Since it typically is not useful to track keywords of one language in a search engine of a different language, doing so will cost keyword credits, but provide little value. For example, if we have a list of 50 English and 50 French keywords, we can use 1/2 as many keyword credits by splitting them into two different groups, as shown in Configuration B below. If you are optimizing for websites that require local specific ranking data, you might want to group keywords by searchers that might search in different locations e.g. chain stores or local businesses. 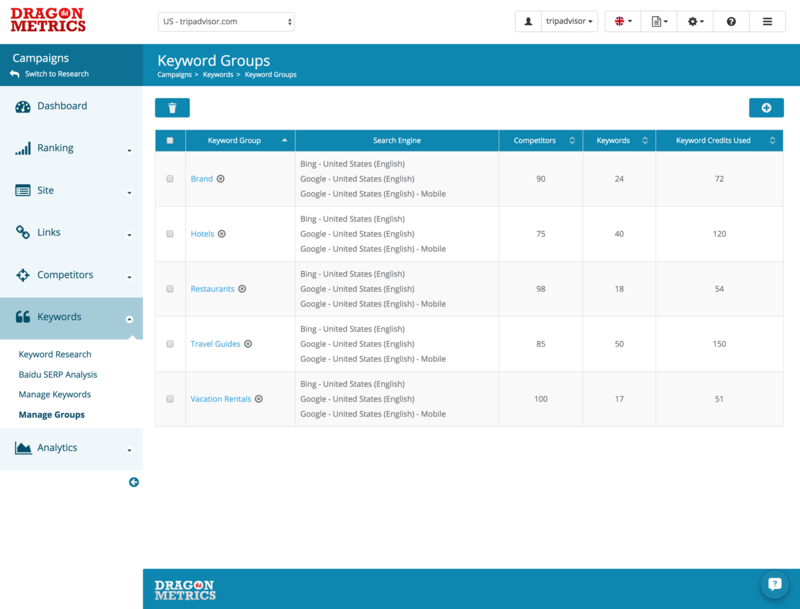 The Keyword Groups page is where users can add new keyword groups and delete or existing ones. This page can be accessed in the Manage Groups under the Keyword area of the left navigation. B - Add New Keyword Group - Clicking this button will open the Keyword Group Details page, where you can add a new keyword group. D - Keyword Group Name - Clicking the name of a keyword group will open the Keyword Group Details page, where the keyword group settings such as search engines, keywords, or competitors can be modified. E - Tracking Search Engines - These are the search engines currently tracking for this keyword group. H - Keyword Credits Used - The total number of Keywords Credits you've been tracking for each Keyword Group, same keyword tracked in multiple search engines are considered to be different keywords in terms of keyword credits, for example in the Keyword Group "Brand" in the image there are total of 24 unique keywords tracked in 3 search engines, which will consume 24 x 3 = 72 Keyword Credits in total.